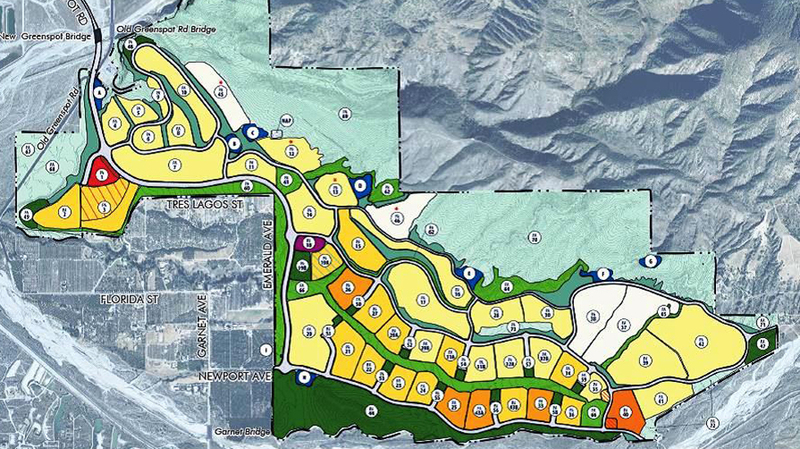 LSA is working on the Harmony Specific Plan for the mixed-use development of approximately 1,650 acres in the City of Highland. The Harmony Specific Plan provides for development of a new community of traditional residential neighborhoods combined with parks and recreation areas, neighborhood gathering places, neighborhood commercial services, and community facilities within an open space setting. The Harmony Specific Plan area is located north of the Mill Creek Wash, south and west of the San Bernardino National Forest, and east of Greenspot Road. The project site is approximately 6 miles east of State Route 210, 4.5 miles north of Interstate 10, and just north of State Route 38. LSA prepared the Traffic Impact Analysis (TIA) for the project and assisted the developer in identifying phasing for the project. LSA recommended a self-mitigating circulation plan for the project to maximize available street capacity for each phase. LSA used the Southern California Association of Governments (SCAG) Regional Transportation Plan (RTP) to create a citywide subarea model for the project. LSA modified the SCAG RTP to reflect the project’s zone structure and proposed circulation network. The TIA included approximately 60 intersections and 50 freeway segments.